The Urban Wood Network invites land owners, arborists, sawyers, woodworkers and all others interested in helping advance the urban wood movement to participate in this free 90-minute webinar. Learn more about the UWN, its goals and how to become a member. In addition, ask questions or share your input with how the UWN can best serve your needs. 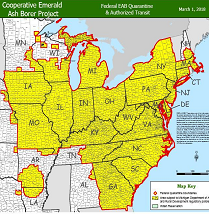 The emerald ash borer's wide path of destruction is captured in the latest North American map of areas under quarantine. Firewood and nursery stock are restricted from leaving the quarantine zone which now includes all or parts of 31 states, Washington, DC, and Ontario and Quebec. Add the Virginia Urban Forest Council to the growing list of organizations upping their game to promote the creation of local urban wood networks. 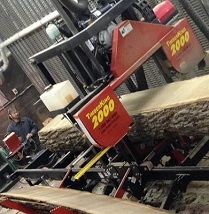 The VUFC recently created the Virginia Urban Wood Group and developed an Urban Wood and Small Woodlot Forestry Business Directory for its website. The Wood Education and Resource Center will present its annual Spring Urban Wood Webcast 1 p.m. to 3 p.m. EST Wednesday, April 3. Ed Cesa U.S. Forest Service, WERC, will host the two-hour webcast.